September 02, 2016, 1:46 p.m. Earlier in the week we published our YouGov/The Times Labour leadership election survey which found that Jeremy Corbyn is likely to be re-elected as Labour leader. As part of the survey we also had the opportunity to ask extra questions of the Labour selectorate, looking at a range of broader issues surrounding the battle for the leadership and soul of the party. Here’s what we found. Various Labour-related conspiracy theories have been doing the rounds over the last few months. Whether it be Len McCluskey claiming that MI5 is working against Corbyn or that Portland Communications helped orchestrate the so-called ‘chicken coup’, clearly many people believe that dark forces are arrayed against the Labour party. Corbyn supporters are the most likely to believe such theories. Compared to the general public, they are almost twice as likely to believe each of the political conspiracy theories we put to them (with the exception of the #useapen theory that cropped up among many Leave voters during the EU referendum). The overwhelming majority of Corbyn supporters believe that the mainstream media is biased against Corbyn (97%) and that PR agencies helped orchestrate the ‘chicken coup’ (90%), and more than half believe that the intelligence services are working to undermine Corbyn (55%). Smith supporters are far more sceptical of such claims, with 44%, 24% and 11% believing them respectively. Belief in these theories is more prevalent among Labour voters in general, however, as well as among the general public at large. One of the issues that the rise of Corbyn has highlighted is the extent to which ideology is all encompassing in the lives of some people. One of the dangers of the proliferation of communications technology is that people now have a greater choice of who to associate themselves with. In doing so, they tend to only associate with like-minded people, reinforcing their own social and political views whilst isolating themselves from anyone who might have a different point of view. The extent to which this applies to the Labour selectorate is now clear. As many as 40% of Corbyn&apos;s supporters don’t believe a single one of their friends would vote for the Conservatives, compared with 19% of Smith supporters and 23% of Labour voters in general. Likewise, whilst 36% of Labour voters say that most of their friends would consider voting Labour, this rises to 58% amongst Corbyn supporters, with a further 7% saying that all their friends would. Smith supporters are more likely to say that only some of their friends would consider voting Labour (46%) than most of them (43%). The prospect of a progressive coalition in Parliament is welcome across the selectorate. 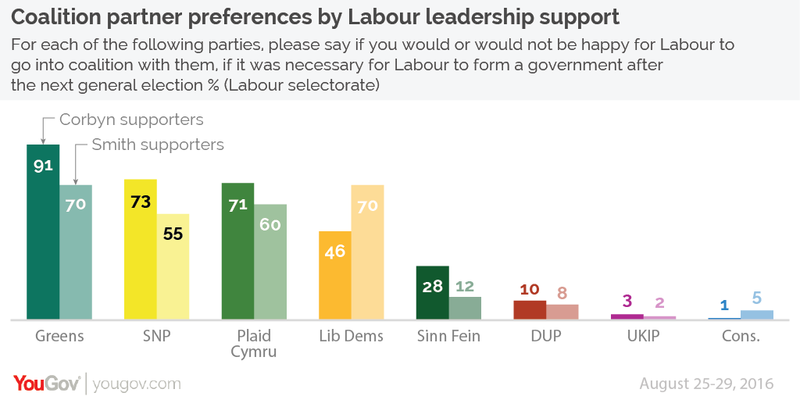 Majorities of both Smith and Corbyn supporters would be happy to be in coalition with the Greens, SNP and Plaid Cymru. This will be welcome news to Green party co-leader Caroline Lucas (who has been pushing the prospect of a progressive alliance at the next general election) seeing as an overwhelming 91% of Corbyn supporters would be happy to go into coalition with the Greens. Corbyn supporters are happier with the prospect of a coalition with almost every party compared to Smith supporters. They are, however, notably more hostile towards the Liberal Democrats, with fewer than half of them (46%) happy to go into coalition with them, compared to 70% of Smith supporters. As an aside, Scottish Labour must be continually dismayed to see how insensitive their comrades south of the border are to their plight. The survey finds that, whilst six in ten (62%) Scottish members of the Labour selectorate would be against a coalition with the SNP, about two thirds of members outside of Scotland are in favour of a coalition with the nationalists. The Labour leadership election has been fractious, but nevertheless the most popular option for Corbyn’s supporters is for Corbyn to forgive the rebels and bring them back into the shadow cabinet (44%). Opinion is divided though, with a sizeable minority (23%) out for blood, wanting Corbyn to deselect the rebels. Smith’s supporters are more split on what the rebels should do. Despite the fact that 77% think that Corbyn should invite the rebels back into the shadow cabinet, only 29% think the rebels should accept this offer. 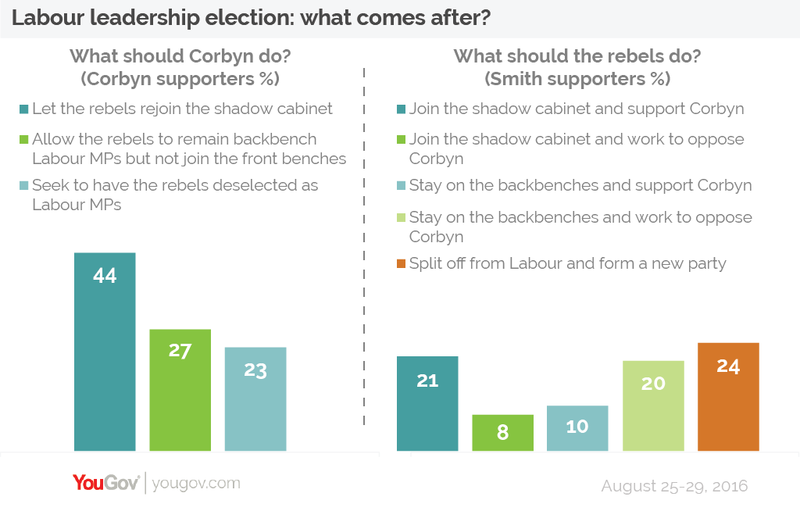 The most popular option is for the rebels to split and create a new party (24%), slightly ahead of rejoining the shadow cabinet in support of Corbyn (21%) or staying on the back benches in opposition to Corbyn (20%). Overall, 31% of Smith’s supporters favour a reconciliatory approach, whereas 52% prefer a hostile approach. By contrast, 79% of Corbyn’s supporters think that the Labour rebels should now get behind Corbyn. Unfortunately for Corbyn, victory at this leadership election probably won&apos;t settle the matter for long. A majority of Owen Smith’s supporters (56%) want to see another challenge, whilst 29% think this should be it until after the next general election. A further 15% are not sure. Despite their preferred candidate’s previous support for annual leadership elections, an overwhelming majority of Corbyn supporters (94%) think there should not be another leadership challenge before the next election. Both sides in the leadership election believe the electoral stakes to be high: with Smith supporters thinking Labour would only win 25% of the vote under Corbyn, and Corbyn supporters thinking Labour would win 27% under Smith, whichever side loses the leadership contest believes that the Labour party is heading to its worst electoral performance since 1918. (Both figures are median results). 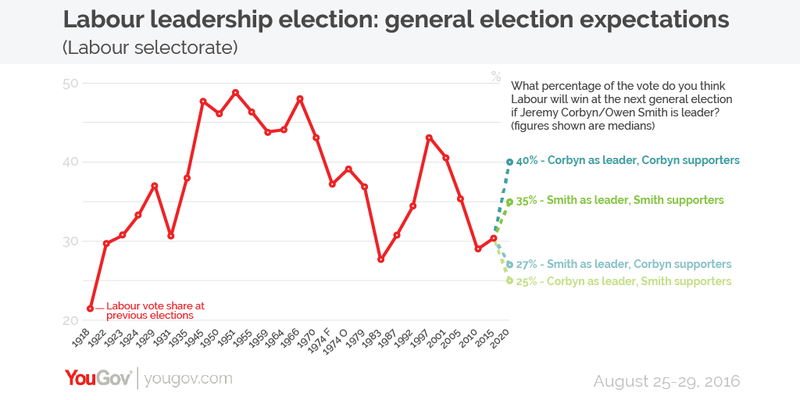 Despite their opposition to Corbyn on the grounds that he can’t win a general election, Smith supporters aren’t exactly optimistic about their own candidate’s chances. When asked what percentage of the vote they thought that Labour would win under Smith at the next election, the median score they gave was just 35%. This score is slightly lower than Tony Blair’s 2005 result, but given boundary reforms and the different distribution of the Labour vote now it is unlikely to result in a Labour victory. 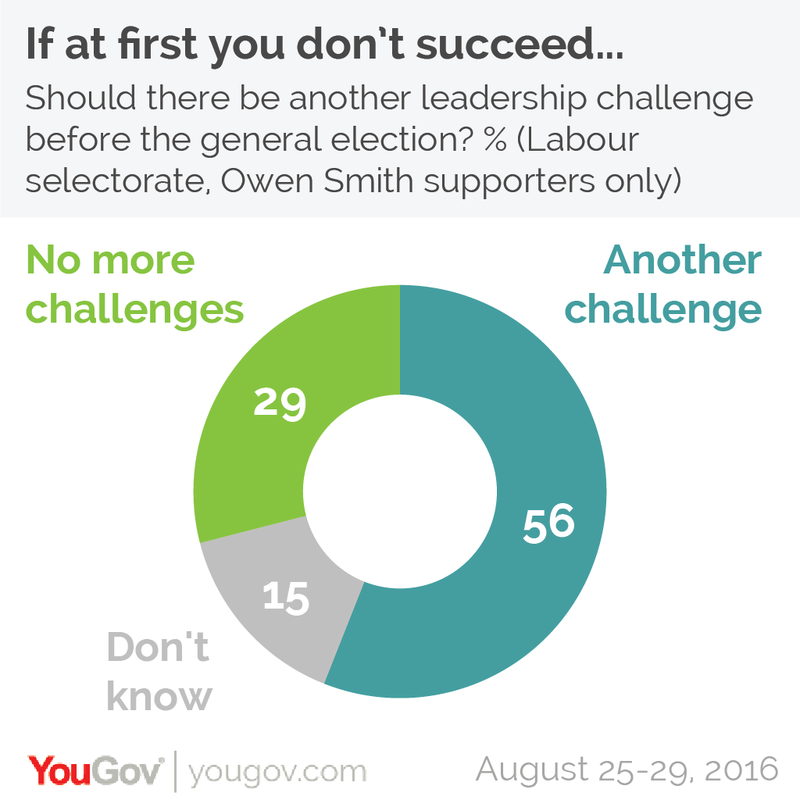 Corbyn’s supporters are far more optimistic about their man’s chances. We previously revealed that 56% believe that Corbyn is likely to win a general election, and we now know that Corbyn supporters expect to win a median 40% of the vote share at the next election. Whilst this would almost certainly be enough to win a majority in the Commons, somewhat embarrassingly it is less than the hated Tony Blair achieved in 1997 and 2001. Many Labour MPs despairing at Corbyn&apos;s takeover of the party have adopted the tactic of waiting for Corbyn to fail on his own terms. Allow him to be rejected by the public at a general election, their reasoning goes, and he&apos;ll either step down or will be easily ousted and control of the Labour party will pass back to the mainstream. Unfortunately, this may turn out to be wishful thinking, with the majority of Corbyn supporters (51%) believing that he should remain leader of the party even if Labour loses the next general election. 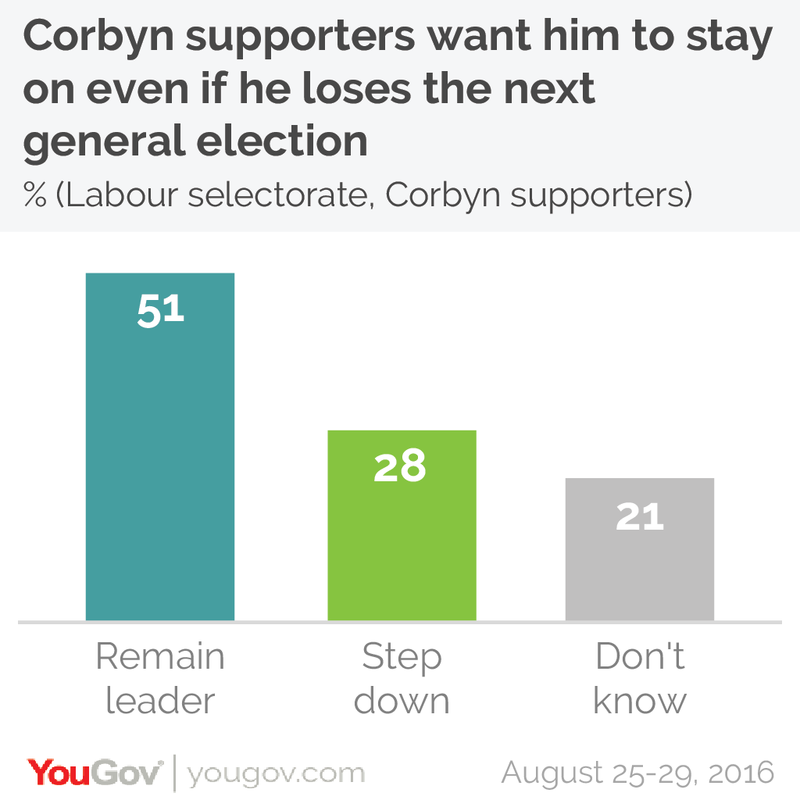 Fewer than three in ten Corbyn supporters (28%) think he should step down if Labour are defeated. If Corbyn is able to continue to attract more and more of his followers to join the party, it may prove impossible for his opponents to wrest back control.